As the anticipation builds for the high-stakes showdown between the world’s top teams to decide the GCL Shanghai, behind the scenes team managers and their riders have been busy discussing strategy and making some crucial substitutions ahead of Saturday’s second round decider. So who are the overnight movers and shakers to look out for in this 19-strong team competition? The all-British London Knights hold sway at the top of the leader board on a zero score and look set to return for round two with all guns blazing from pole position. Ben Maher brings back his buzzy chestnut rocket from round one, Explosion W, while his U25 team-mate and student Emily Moffitt swaps on to another of her top horses, the 11-year-old mare Tipsy Du Terral, for Saturday’s concluding round. Ready to soar once again are the extremely powerful Berlin Eagles’ duo of Ludger Beerbaum on Chiara alongside Christian Kukuk with Limonchello NT, both representing Germany. The Eagles are one of 11 teams to field the exact same pairings for round two. Sitting in second position overnight, they also remained faultless in round one but simply couldn’t match the speed set by the Knights. With the second round run in reverse order of merit they’ll need to apply the pressure if they’re to topple the Knights off their perch. 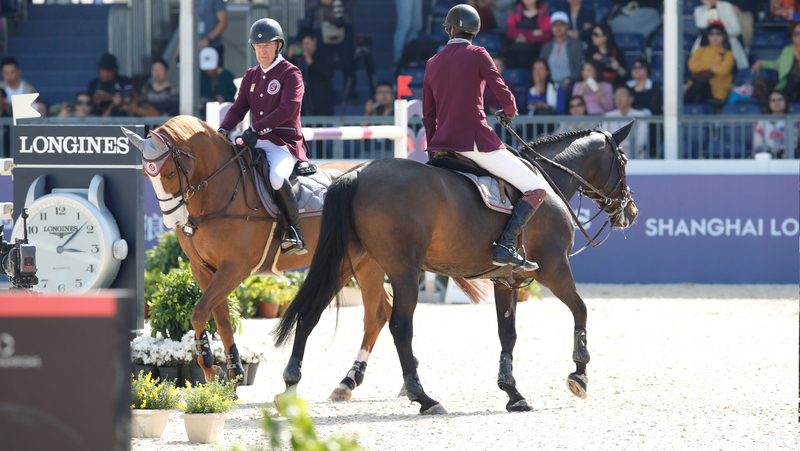 A total of four teams — Chantilly Pegasus, Monaco Aces, Doha Fursan Qatar and championship leaders Valkenswaard United — are poised on four faults and only the latter makes any substitutions with Alberto Zorzi (ITA) swapping from Fair Light van T Heike to the 14-year-old Contanga. Despite providing the home team Shanghai Swans with a valuable clear in round one, Daniel Deusser (GER) will saddle Tobago Z instead of Cassini Bay for round two, while Alexandra Thornton (GBR) makes up the duo once again on Cornetto K. They carry forward five penalties while breathing down their necks in eighth on a score of six are the St Tropez Pirates, who also return with no changes on their roster. With just two rails separating the top 12 teams, this could be one of the tightest finishes yet in the GCL Championship and the mighty duo of New York Empire’s Scott Brash (GBR) and David Will (GER) look particularly dangerous and determined to climb back up the leader board from their eight point total. Only two squads have made rider substitutions for round two of the third stage of the GCL, with Jos Verloy being drafted in to replace Danielle Goldstein for the 14th placed Montreal Diamonds for whom the young Belgian sides up with the all-conquering Harrie Smolders (NED). The Prague Lions, winners in Miami, hope to roar even louder on Saturday with Ales Opatrny (CZE) taking the place of Anna Kellnerova (CZE) alongside Niels Bruynseels (BEL) this time riding Cas De Liberte. Is there an advantage to be gained from fielding fresh horses and riders? Or will proven combinations be better placed to claw their way up the leader board? With every point counting towards qualification for the GC Prague Play Offs in December, every team’s strategy will be under close scrutiny as they line up for this crucial decider. It’s set to be an absolute scorcher. Tune in via GC TV at 12:15 local time to watch all the action LIVE!